Tea Farmer: Mr. Iizuka, Jr. Appearance: the leaf is small in size, easy to measure and a dark forest green color. Shows expert handling by Iizuka Jr.
We follow our mentor Mr. Saito’s instructions for steeping Japanese green tea and he has been spot on. While it is unusual for a tea farmer to process his own tea, this is an accomplishment that Mr. Saito and the other members of the Shizuoka Organic Tea Farmers Union are proud of. Jien-cha gives them total control over the finished tea, and also allows them to put all their years of knowledge about tea cultivation and manufacture into making truly delicious artisan tea. 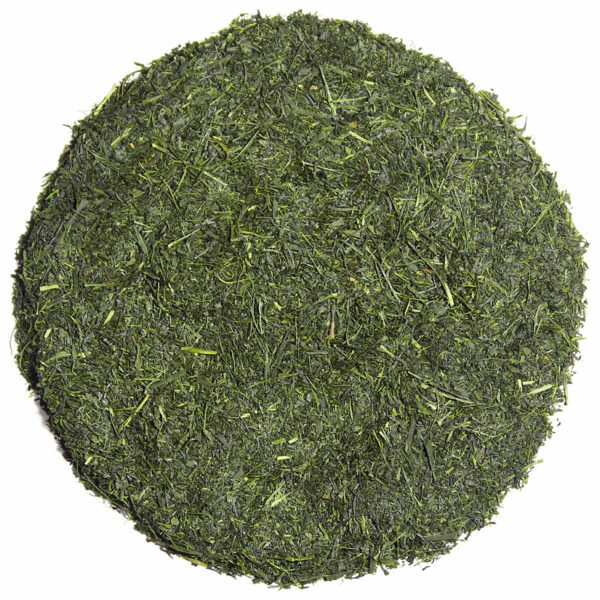 Those who enjoy Japanese sencha know that Sencha is traditionally a blended tea and that elements of terroir such as tea garden location and tea bush cultivar conspire to create the the many varied tastes of sencha. However these elements are brought together in sencha manufacture by the split-second choices made by the tea blender/buyer while tasting samples of ‘aracha’ at the tea market. Local tea bush cultivars can be ‘heirloom’ varieties while others are new cultivars that have been developed by one of the Japanese government’s tea research institutes or by educated and experienced tea farmers such as Mr Iizuka and his eldest son ‘Junior’ . This Sencha is not a blended tea. It is made from 100% Okumidori leaf, a rare tea bush cultivar that has become popular among knowledgeable tea enthusiasts in Japan for its delicious taste and fragrance. Part of the explanation for the unique flavor of this tea is that it is a late-picked tea, somewhat of an unusual timing for green tea leaf harvesting. Okumidori translates loosely as ‘deeply or intensely green’, which partially references this late harvest and the maturity that the leaf has when picked. This tea is produced by the son (Junior) of one of our premiere tea producers, Mr. Iizuka. Their tea gardens are in Fujieda-shi, a little-known but wonderful area that produces some of the finest sencha and black teas in Shizuoka Prefecture. As evidenced here, the tea bush cultivar as well as many other elements of terroir such as soil, climate and the skill of the tea farmer come into play to make something that could be ordinary be….’extraordinary’. We at Tea Trekker are quite fortunate to have been offered this selection from ‘Junior’, because we think that a unique cultivar such as this is an example of tea that is unknown to many tea enthusiasts. 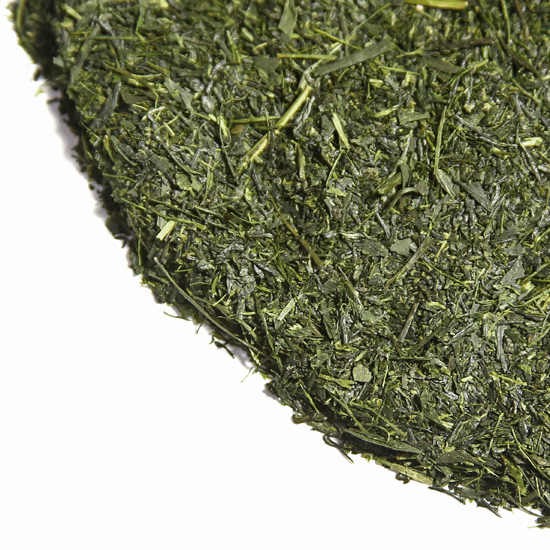 The finished leaf of this Okumidori sencha is a deep dark green, chopped to the traditional small size for consistent, reliable steeping. The particles have the beautiful mottled coloration that uniform steaming will provide when done well. The flavor is well-structured and deep, representing the maturity of the leaf at harvest. The taste is pure and straight-forward – fresh, deep, smooth, and sweet. The aroma is deeply vegetal with elusive notes that can be difficult to pinpoint. The steeped tea liquor is a clear medium green and is an excellent representation of the well-flavored tea that it is..
For the enthusiast as well as the beginner, this tea is easy to measure and steep, and re-steeps extremely well. In 2012 Mary Lou was asked to visit Japan with an international group of tea experts, on a trip to meet with a variety of tea farmers and evaluate the tea market and explore new export potentials for premium tea farmers. In Shizuoka Prefecture she met with a group of farmers who were united in their desire to grow premium tea organically and to attempt to continue to grow some of the more unusual cultivars that many farmers have ceased to maintain. Mary Lou affectionately gave these farmers the moniker of the “Four Musketeers’ of Shizuoka premium organic tea. We have developed a strong relationship with this group in the years since, and their tea has been amazing. One of the farmers in this group was Minoru.Iizuka. He has been an organic tea farmer for more than 40 years now, and his eldest son, Iizuka Jr was just starting to follow in his father’s footsteps when Mary Lou visited with them. For this season (2018) Mr Iizuka, one of the original ‘Four Musketeers’ of SOTFU, again wanted to show us examples of the current work of his son. Known to his friends and colleagues as “Junior”, he has really come into his own as a tea farmer and manufacturer in the last decade. The family gardens are in a region known as ‘Fujieda-shi’ which is of historical importance regarding both green and black tea manufacture in Japan (for those who follow Japanese tea gardening and manufacture). We were offered two teas from the Iizuka family’s tea gardens this season and, on tasting them, accepted both without hesitation! This tea, the very unusual cultivar Okumidori Sencha, is special for many reasons: the history of the location of the gardens, the long history of the family in this region, the depth of commitment to organic farming, the knowledge and experience of the family regarding tea cultivation and manufacture, all of which combine to realize the over-all goodness of the leaf being produced.